Neues deutsches Kino on the world stage has more or less become synonymous with the filmmaker Wim Wenders, who is also a prolific photographer whose exhibitions have graced galleries the world over, from Paris to New York, Shanghai to Sydney. 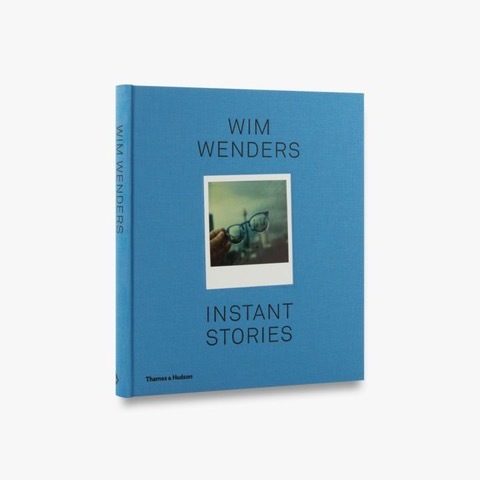 If you are a friend of Wenders’ photography and familiar with his oeuvre, you might want to adjust your expectation a tad as Instant Stories is focused on his personal Polaroid collection he presented at London’s Photographer’s Gallery. The collection covers the last five decades and depicts his comrades, mentors, celebrities, everymen, odd and not so odd objects, situations, places, et cetera from Wim Wenders’ personal life. A documentary of sorts devoid of themes and accompanied merely by short essays or haikus. The book is mainly for the die-hard Wim Wenders aficionado who is interested in the genesis of his hero, his development and evolution. Wenders would probably be the first to admit that it is deliberately pedestrian and “alltäglich” and not necessarily created with an overly artistic approach – in other words: There are none of Wenders’ opulently orchestrated grandiose and beautiful photographs of vernacular architecture. Now, it can be argued if Polaroid photographs bear any merit at all or if it is more of a note-taking device. Apparently Wenders discovered the depicted Polaroids in an old wooden cigar box, which explains the deterioration of some of the photos and one at times cannot help but wonder what motivated Wenders to publish them. What does make the book interesting are the accompanying texts and Wenders’ thoughtful, narrative voice. Not essential but certainly a nice addition for any Wim Wenders’ enthusiast and completist.